New mom Gigi Leung(梁詠琪) recently gave birth to baby girl named Sofia last month. She is currently enjoying being a mother for the first time with her Spaniard husband, Sergio Crespo Gutes. Today, she posted a selfie showcasing a boxset of macarone and chocolate she ordered from a well known French Bakery DALLOYAU to give to her friends in celebration of her daughter's birth with the message: "Thank you for everyone's blessing and love. I will begin to ship up the special macarone and chocolate boxsets I ordered from Dalloyau to give to my friends to share the joy of my daughter's birth!" 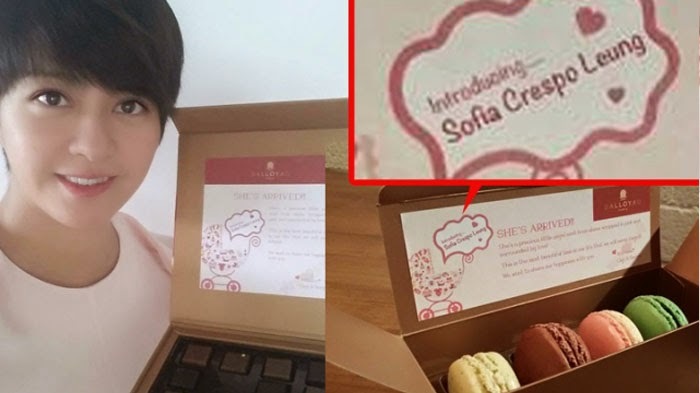 Seeing the boxset is printed with Gigi's daughter's full name as "Sofia Crespo Leung", many netizens were questioning if the baby is taking the mom's surname instead. Gigi then pointed out that the Spanish naming custom is consisted of a person's given name followed by two family names (surnames). The first surname is usually the father's first surname, and the second is the mother's first surname.